Our modular design allows you to customize your enviro trailer to suit your needs. Some common configurations are: 2 outhouse/2 garbage-bin, 5 outhouse, or 3 garbage-bins. We can also add a fuel transfer tank if needed. Our enclosed design offers 2 heated washrooms, oil and oily rag storage, and a garbage compartment. Give us a call with your needs, and we will find a solution that works for you! 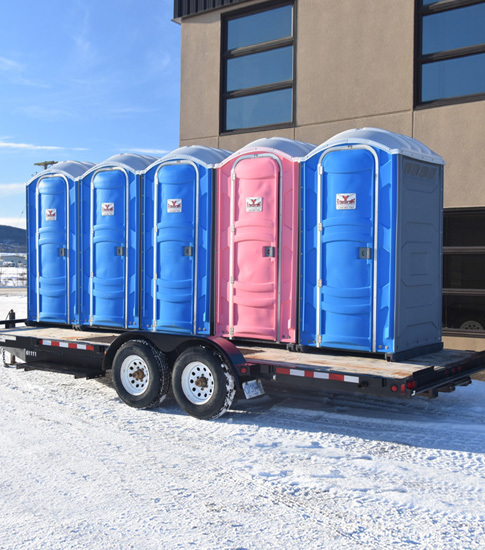 Can be customized with fuel transfer tanks, more portable toilets, or any configuration to suit your needs.